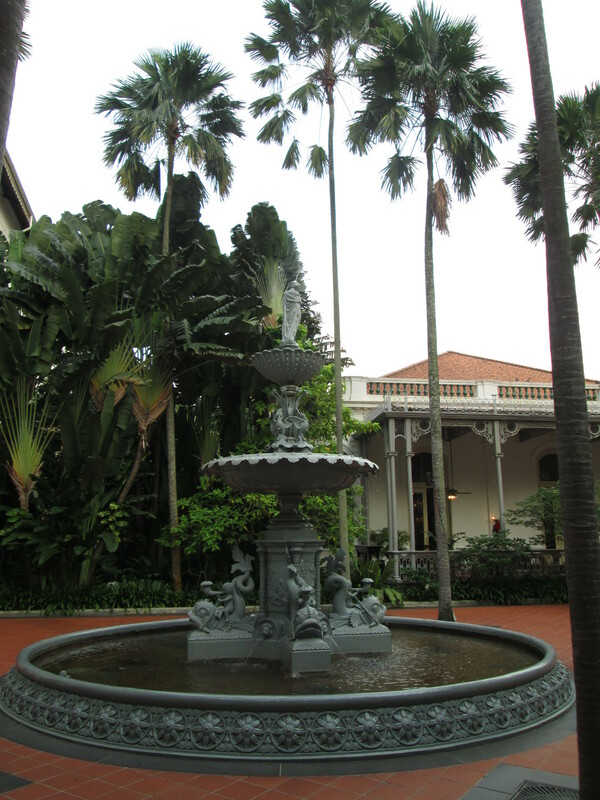 We couldn’t resist a visit to Raffles in Singapore, not for a Singapore Sling, but for Afternoon Tea. With only 24 hours in the city, though, that meant we didn’t get to revisit the wonderful Tea Chapter in Neil Road for a Chinese tea experience (you’ll have to see the Fancy a Cuppa blog entry for our views on that). So for this trip, it was Raffles and only Raffles. We quickly found out that the done thing for afternoon tea at Raffles is to reserve a table, as elegantly-dressed couples and groups sailed past us into the tea room, while we were asked to wait. In fact, we were told, it would be 45 minutes before a table was free and, they added, with local taxes and service added (the so-called plus-plus), our afternoon tea would come to some £50 a head (as if that would put us off, when we’d travelled so far…). 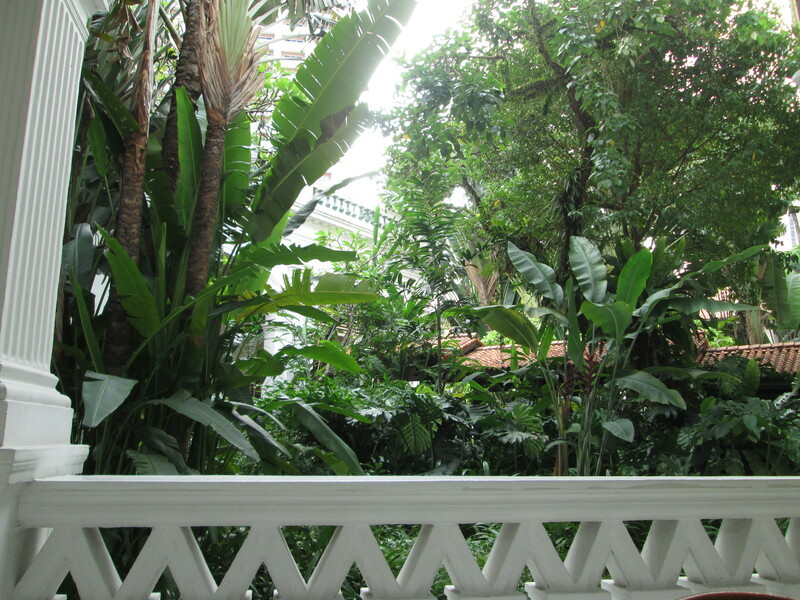 So, we sat and waited in the sultry, but leafy grounds of the hotel and watched people coming and going, some dashing by on their way to their (presumably reserved) tea, others just coming in for a selfie in this hotel of all hotels in Singapore. Some of the Trip Advisor and Google reviews of afternoon tea at Raffles do speak of the confusion over just what afternoon tea consists of, what you are obliged to have, and how much it all costs. Some even say they were forced to have the champagne tea, taking the price way over what we had been quoted. There was never any question of champagne for us (maybe we just didn’t look the champers types), but when they came to serve us and spoke of the eat-all-you-can buffet in the other room, with spring rolls, fruit and other delights, we told them we actually just wanted a regular tiered tray afternoon tea with a pot of tea of our choice. Was that possible? Slightly bemused by the pricing system, we sat and waited for our tea to arrive, taking in the atmosphere. 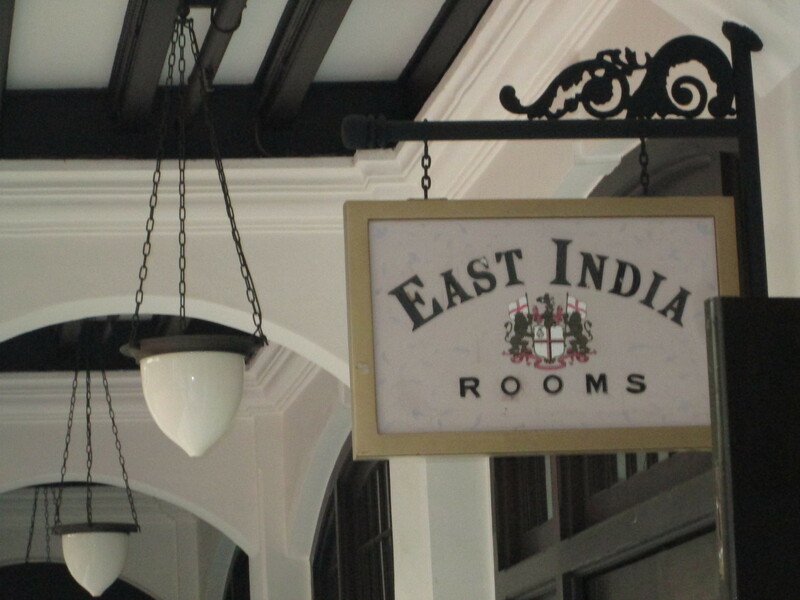 We enjoyed the old colonial feel and the notice that spoke of this (the Tiffin) dining room having been the best ‘east of Suez’, though there’s something about the stuffiness of those exclusive colonial hang-outs and the fawning nature of the service in them that would put us off going too often. 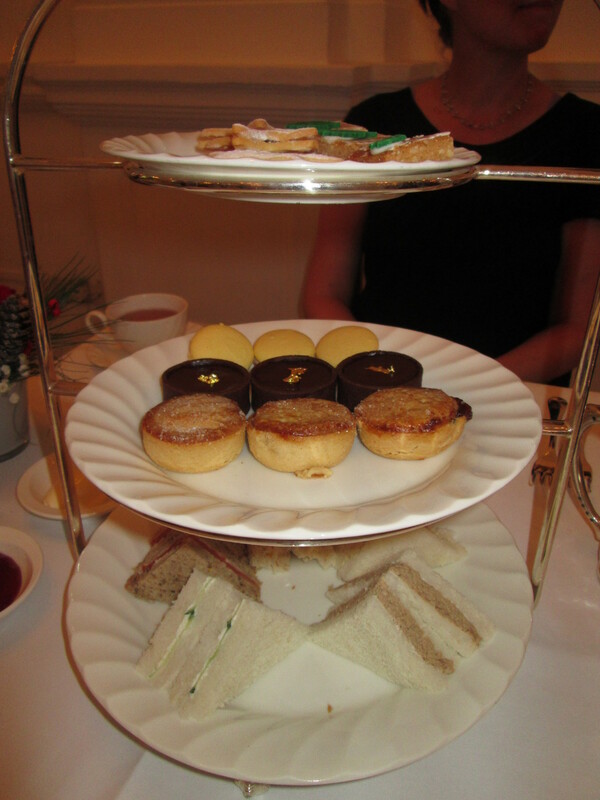 Actually, the afternoon tea was quite generous (five little sandwiches each, macaroons, little pastries, mince pies – being near Christmas), with a quality pot of tea (Darjeeling for me, English Breakfast for Anita), and a delightful harpist strumming away in the background. The mystery, though, were the dishes of clotted cream and jam that sat untouched on the table next to the tiered tray. Untouched because…there were no scones to spread them on. Hmmm. I’m not sure what the Colonel and his wife would have made of that in colonial days, but we smiled to ourselves and made do without, only for the waiter to appear suddenly with a plate of four scones for us, thrown in gratis, I think because by this time they were at the end of the afternoon tea time and most people were turning to Singapore Slings. And one final gripe about Raffles. I know it’s the tropics and you can’t really avoid them, but the tea room was abuzz with flies, mostly quite small, but somewhat disconcerting as they wander over your sarnies or macaroons before you take a bite. Other than that, it was a beautiful afternoon and actually well worth the cost. 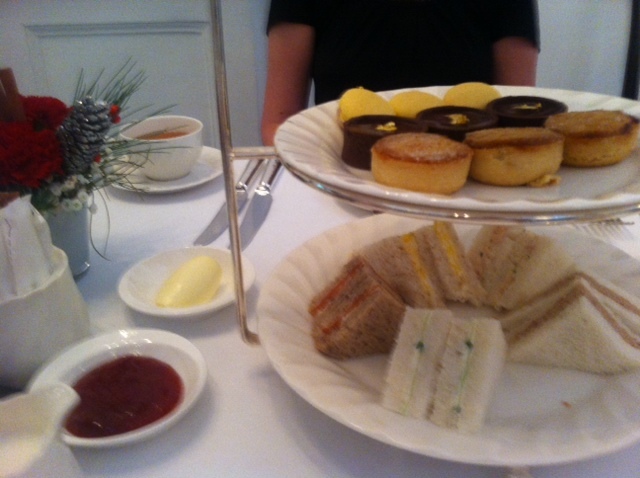 So a hearty thumbs up from us for afternoon tea in Singapore at Raffles. There is more to tea in Singapore than Raffles, but at least once in your life, do give it a go.